The arcade between the chancel and south (Templar) chapel. 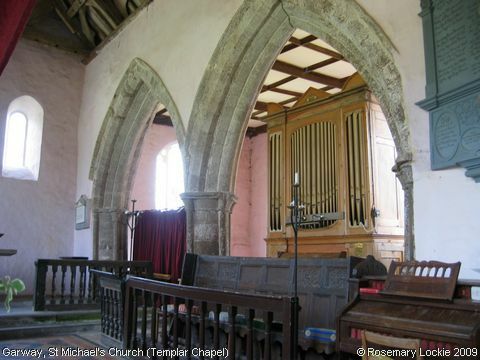 The chapel was added about 1210, but was partially rebuilt by the Tudors in the 16th century. The lintel in its south east window is made from one of the Templar slabs, but it has been whitewashed so the carving of the sword is difficult to see. Image contributed by Rosemary Lockie on 25th June 2009.